Návrat firem z daňových rájů, nebo jen přesun západ-východ? Notebook Miloše Čermáka: Lidský znamená nepředvídatelný, takže nebuďte algoritmy! Co je horší? Být dobrým ministrem špatného ministerstva? Nebo špatným ministrem dobrého ministerstva? Karel Havlíček a Vladimír Kremlík nám to brzo řeknou. IN JANUARY 2017 in Dos Hermanas, a large dormitory town outside Seville, Pedro Sánchez launched a bid to regain the leadership of Spain’s Socialist Party, from which he had been ousted in an internal coup three months earlier. Few in the Madrid political establishment gave him a chance, yet after months driving from rally to rally in his 12-year old Peugeot 407 he won his job back in a party primary. Last May he showed the same determination and sense of opportunity when he organised a censure motion that installed him as prime minister of a minority government at the expense of Mariano Rajoy, a conservative whose People’s Party (PP) has been tarnished by corruption. THE REMOVALS in the same month of two presidents—Abdelaziz Bouteflika of Algeria and Omar al-Bashir of Sudan—look like an unforeseeable coincidence. But they are also two more data points for analysts trying to turn the art of predicting political upheaval into something approaching a science. Some believe they have the tools to make an attempt. Coups and revolutions present unique challenges for forecasters. They are both extremely rare and, notes Andreas Beger of Predictive Heuristics, a consultancy, by definition conspiratorial—they do not advertise themselves in advance. Perhaps the most rigorous quantitative forecast of political upheaval comes from One Earth Future (OEF), an NGO based in Colorado that publishes a predictive model, CoupCast. 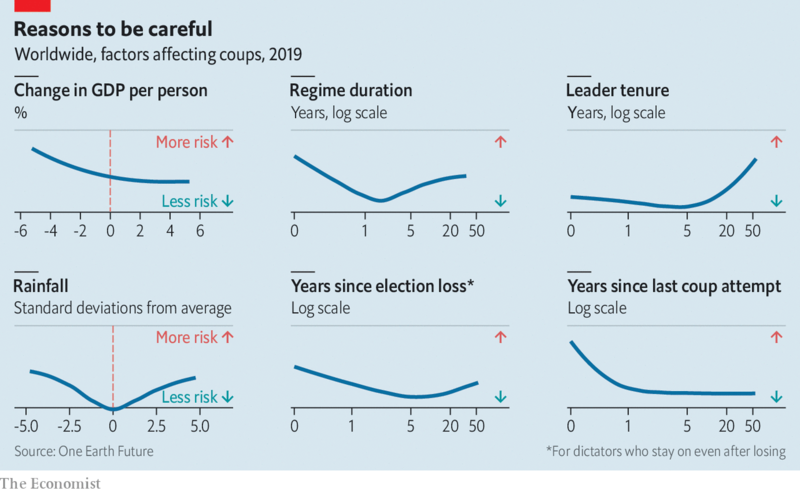 It reckons that the factors correlating most strongly with the risk of a coup include: the rate of economic growth; how long a regime has been in power; how long since a country’s most recent coup; and whether it has been hit by extreme weather, such as a flood or a drought (see chart). ON THE STREETS of Khartoum, the capital of Sudan, people are breathing a heady mix of fear and hope. Since April 11th, when a cabal of army officers pushed out the 75-year-old Omar al-Bashir, the country’s president for the past 30 years, Sudan has had two more of its bloodied leaders step down. On April 12th, just a day after taking control, Awad Ibn Auf, the defence minister and head of the self-appointed “transitional military council”, resigned. The next day, so did Salah Abdallah Gosh, the head of the much-feared National Intelligence and Security Service (NISS). On April 13th the latest military leader, Abdel Fattah Abdelrahman Burhan, announced his intention to “uproot” the military government, prosecute those guilty of killing protesters and reform the NISS. He has promised to hand power over to civilians within two years. The protesters camped outside the defence ministry over the past week have succeeded in changing their country. SEVERAL MIRAGE 2000 fighter jets took off from an air base in N’Djamena, Chad’s capital, on February 3rd and flew north over the savannah and the scrubby Sahel towards the Sahara Desert. There the French planes bombed a column of some 50 lorries carrying rebels south from the Libyan border. Paris’s action was co-ordinated not with the rest of the EU, but with Chad’s brutal government and Khalifa Haftar, the Libyan warlord who controls swathes of his country. Today France is still backing General Haftar as he shells the post-Qaddafi “government of national accord” in Tripoli. On April 10th Paris blocked an EU statement urging him to stop, infuriating its European allies. THE CATHEDRAL of Notre Dame is a “majestic and sublime edifice”, a “vast symphony in stone”, wrote Victor Hugo. “Every surface, every stone of this venerable pile, is a page of the history not only of the country, but of science and of art.” The devastating fire that broke out on April 15th, and destroyed much of the gothic cathedral’s wood-timbered roof and spire, stunned and distressed the French with a force that far exceeded the building’s religious significance. As the flames engulfed the roof, President Emmanuel Macron spoke for many across France when he tweeted that he was witnessing “part of us burn”. Why has the fire at Notre Dame stirred such emotion in France? In a city of broad vistas and stolen glimpses, it serves as a fixed point for Parisians; a stable presence that emerges reliably into view, like a much-loved aunt, from bridges across the river Seine. Visited by 13m tourists a year, the cathedral has been the backdrop to countless expressions of awe and romance, as well as been-there selfies. Locals may be riled by the narcissistic crowds, but are proud of what draws them. The 850-year-old cathedral is a national landmark that offers something particular: a form of timelessness, drama and spirituality, to set against the modernity and engineering prowess of the Eiffel Tower. THE FINNS are the happiest nation in the world, according to the United Nations, and tied with Sweden and Norway for the freest, according to Freedom House. They are also at or near the top in education, not to mention consumption of coffee. But after the national election on April 14th, they have given up their claim to have solved the problem of far-right populism. The Finns Party, an anti-immigrant, Eurosceptic party previously known in English as the True Finns, surged in the final weeks and took 17.5% of the vote, just a whisker behind the winning Social Democrats at 17.7%. The Social Democrats will probably now form a centre-left government, but as in so much of Europe, the far right’s strength will make things complicated. The Finns Party’s result was almost exactly the same as in 2015. But after that election, the country’s centre-right National Coalition and Centre parties thought they had tamed them by bringing them into the ruling coalition, forcing them to take responsibility for compromises such as observing EU migration policy. But in 2017 the Finns’ frustrated hard-liners quit the government while the party’s more moderate MPs (including the then-leader) split off into a new faction called Blue Reform.